Each September, we focus on the intersection of Arts and Social Justice in our exhibitions at Harwood. This year, we are thrilled work with and showcase Jodie Herrera. 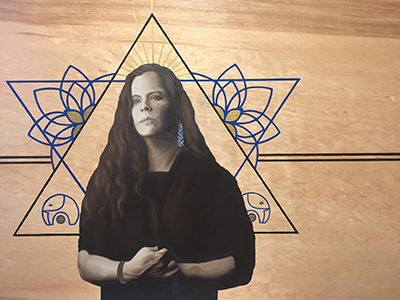 Her current exhibition, Duality, features inspiring portraits of three local women and their stories of hardship, survival, and resilience. Herrera’s paintings strive to serve and celebrate the beauty and resilience of the women she has the honor of working with. She hopes that the paintings can provide a source of strength and inspiration for others, especially when it comes to seeking help. 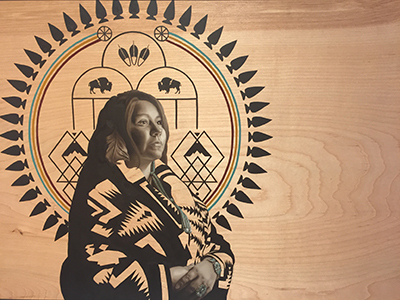 For this exhibit, Herrera collaborated with three local initiatives to source her subjects: The Refugee Well Being Project at The University of New Mexico, Solace Crisis Treatment Center and with the creators of Walking the Healing Path, an indigenous activist documentary film. This collaboration was formed with the intention of highlighting just a few of the many helpful and educational resources New Mexico has to offer and to demonstrate the powerful effects they have on the people of our community. The women Herrera worked with and painted are extraordinary individuals. Saree, Jaycee, and Hope are strong women who have continued to serve their communities and families, even when faced with extreme adversity. To see the paintings alone, you can sense the women’s power and spirit: Herrera masterfully renders her subjects, capturing the essence of the women she paints. When you read the stories of the women, the paintings become even richer in meaning. We hope you will be as inspired by these amazing women as we are. 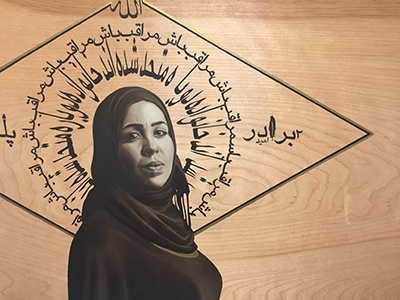 Below are the stories of these women and the way their lives have been translated into paintings. This painting narrates the story of Saree, a refugee from Kabul, Afghanistan. Saree arrived in the United States in 2013 with her ailing mother and two nephews, all of whom she is responsible for at the young age of 23. The forward facing pose in the painting portrays the confidence and will power she has found, and must continue to find, within herself to push ahead. Before coming to America, Saree was in a refugee camp for seven years in Pakistan. At one point, already malnourished and without shelter, the family belongings were destroyed in a flood. They were left with nothing. In the depths of this desperate situation, Saree met a kind and generous man who contributed his time and resources to help her, her mother, and two nephews through the laborious process of applying and coming to America. Saree and her family have experienced extreme loss due to the catastrophic violence in her country. Her father was killed by the Taliban. After losing his eyesight and his job as a government artist, he “allowed” his wife to work for the state, which the Taliban prohibited. To the left of Saree, the painting reads “father,” with one letter in the shape of a paintbrush to represent that for which he lived and died. To the right reads “brother”, with three symbols surrounding to represent her three brothers. Tragically, one of her brothers was murdered, along with his pregnant wife and unborn child. The day when they were killed, dozens of their turkeys mysteriously died. The feather in the middle of “brother” symbolizes this great loss. He left behind two children that are now in Saree’s care here in the states. Another brother was abducted by armed men from their home and has never been seen again. Her mother still prays and hopes every day for him to reappear. Below “brother” reads “hope,” a small prayer for his return. Saree’s third brother was in hiding for 10 years because he was afraid the same would happen to him. During this time, he had no contact with his family. He now lives in Kabul with his wife and seven children, facing death each day in order to support his large family. Not only is his life threatened by the extremely dangerous political landscape, but he also receives death threats and abuse almost daily for his family’s “betrayal” in relocating to America (it is a common belief in Saree’s home community that those who fled to America have betrayed Afghanistan and Islam). Saree, her mother, and nephews pray each day for the safety of her brother and his family. The outer circle of the painting reads “be safe.” The inner circle reads “family Reunited” – her one and only wish. Saree and her family have been through an emotionally and economically exhausting relocation process. We are seeking help in any way shape or form to lighten the load for this family but most importantly to gather resources and information necessary to reunite her with her brother and his family here in New Mexico. If you feel like you can contribute in any way please contact Sari at the email or phone number below. This painting narrates the story of Jaycee. Jaycee is an advocate and educator at Solace crisis center in Santa Fe, New Mexico. Jaycee teaches Trans 101 and consent workshops for high schools, businesses, and native youth. Her life’s work is represented in the painting by the equality sign running horizontally though painting. Jaycee, a transgender woman, has known her true identity for as long as she can remember. Her earliest relevant recollection is her feeling of joyful exhilaration when she dressed up as bat-woman at age four. The golden cuff she wears in the painting represents her heroine-ism on her journey through life. Jaycee states “the hardest thing is getting through the door each morning.” Facing people’s prejudice each day for simply being who she is, is challenging. In the background of the painting, two triangles represent the duality of her sexuality and heritage. The downward facing triangle represents female and the upward, male. Together they illustrate the beautiful story of her transition. The triangles also symbolize Jaycee’s mixed heritage. She never knew her Hispanic, biological father and was raised by her single, Anglo mother in Texas. Although she felt a lack of access to her Latina identity growing up, she has since been able connect to that side of herself through her current community. This duality of self and culture is represented by the two triangles overlapping each other. Jaycee was in a heteronormative relationship, married and with two children. When coming out to her children and now ex-wife, they were very supportive. Her son and daughter not only fully support Jaycee, but also enthusiastically advocate on her behalf. In the painting, the two flowers represent her children and their growth together in life. Elephants are Jaycee’s favorite animal and are known to be emotionally intelligent and stick with their herd. Although it was difficult for the rest of her family to digest at first, they now fully support Jaycee. The elephants on each corner of the triangles symbolize Jaycee’s relationship with her family. The golden dots on the underside of each elephant represent Jaycee’s partner, who has made her feel loved and appreciated for who she is and feel beautiful inside and out. Before Jaycee’s transition, she was very reserved and admits to not having taken care of herself emotionally or physically. She was depressed and felt misrepresented. Now Jaycee is healthy and outgoing. She had found happiness and self-love through support and the power to fully express who she is. This love-born, self-empowerment is represented in the painting by golden beams radiating from her crown. This painting narrates the personal story of Hope. Hope is a survivor of homelessness and both domestic and sexual abuse. Hope’s first encounter with abuse was at the age of 5. Sadly, she would have to experience such trauma again and again. She withstood of cruelty perpetrated by family members, care givers, and those exploiting safe spaces. The symbols at the bottom of the circle to the right and left are renditions of a survivor symbol, comprised of a unity symbol, an infinity sign, and a mountain range to represent her strength and defiant refusal to break under such immense pressure. Hope also struggled by not having a stable home. By the age of eleven she, her little brother, and her single mother had moved multiple times all across the US. The Tee-pee in Hope’s painting represents a “temporary shelter” to illustrate this demanding transience. Eventually her family settled in Albuquerque, where she began another battle. In order to escape her mother’s abusive boyfriend, who also tried to sexually assault her, Hope found herself without a home. While homeless and in and out of shelters until the age of 18, Hope continued her schooling, volunteering, and working; maintaining a 4.3 GPA. Hope also remained politically active, and was a key player in passing a bill that gave free educational tuition to those who were in foster care for over a year. The eagle feathers above her head symbolize her remarkable strength, wisdom, and perseverance in soaring above adversities and reaching her goals. Over the years, Hope has become a leading activist and advocate for many causes. One particularly close to her heart is the NO DAPL movement. She has fought to protect the most vital element for the sustenance of life, water. The rain cloud symbol above her head signifies this fight, as well as renewal and change, and is also a magical symbol to promote good prospects in the future for the Diné. While protesting at Standing Rock, Hope’s Grandmother spotted a herd of buffalo. Hope is wearing the blanket of her grandmother, whom she has always been incredibly close with. Hope is also adorning her great mother’s turquoise jewelry. Just as the buffalo are being reintroduced into the land, so is the strength of the indigenous people, and our union with the earth. The two buffalo within the circle symbolize this connection. At the top of the painting is Hope in Diné along with a ring of arrowheads and rainbow, partial elements of Diné symbols. The arrowheads represent protection, while the rainbow represents harmony and vitality. There are also two hogans, permanent dwellings, at the end of each side of the rainbow. This is to represent a home and prosperity for Hope, something she has worked very hard and against all odds to provide for herself. Hope’s name is a symbol itself. Without hope she couldn’t have come this far. Hope is how she moves forward. Now, she seeks to help others find hope.